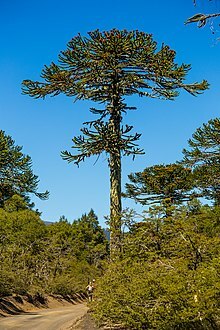 Araucaria araucana (commonly called the monkey puzzle tree, monkey tail tree, piñonero, or Chilean pine) is an evergreen tree growing to 1–1.5 m (3–5 ft) in diameter and 30–40 m (100–130 ft) in height. It is native to central and southern Chile and western Argentina. 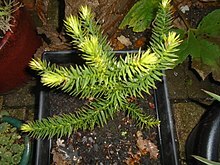 Araucaria araucana is the hardiest species in the conifer genus Araucaria. Because of the longevity of this species, it is described as a living fossil. It is also the national tree of Chile. Its conservation status was changed to Endangered by the IUCN in 2013 due to the dwindling population caused by logging, forest fires, and grazing. The leaves are thick, tough, and scale-like, triangular, 3–4 cm (1.2–1.6 in) long, 1–3 cm (0.39–1.18 in) broad at the base, and with sharp edges and tips, rather similar to the leaves of the unrelated succulent plant, Crassula muscosa. According to Lusk, The leaves have an average lifespan of 24 years and so cover most of the tree except for the older branches. It is usually dioecious, with the male and female cones on separate trees, though occasional individuals bear cones of both sexes. The male (pollen) cones are oblong and cucumber-shaped, 4 cm (1.6 in) long at first, expanding to 8–12 cm (3.1–4.7 in) long by 5–6 cm (2.0–2.4 in) broad at pollen release. It is wind pollinated. The female (seed) cones, which mature in autumn about 18 months after pollination, are globose, large, 12–20 cm (4.7–7.9 in) in diameter, and hold about 200 seeds. The cones disintegrate at maturity to release the 3–4 cm (1.2–1.6 in) long nut-like seeds. The thick bark of Araucaria araucana may be an adaptation to wildfire. Its native habitat is the lower slopes of the Chilean and Argentinian south-central Andes, typically above 1,000 m (3,300 ft). Juvenile trees exhibit a broadly pyramidal or conical habit which naturally develops into the distinctive umbrella form of mature specimens as the tree ages. It prefers well-drained, slightly acidic, volcanic soil, but will tolerate almost any soil type provided it drains well. Araucaria araucana is a masting species, and rodents are important consumers and dispersers of its seeds. The long-haired grass mouse, Abrothrix longipilis, is the most important animal responsible for dispersing the seeds of A. araucana. This rodent buries seeds whole in locations favorable for seed germination, unlike other animals. Logging, long a major threat, was finally banned in 1990. Large fires burned thousands of acres of Araucaria forest in 2001–2002, and areas of national parks have also burned, destroying trees over 1300 years old. Overgrazing and invasive trees are also threats. Extensive human harvesting of piñones (Araucaria seeds) can prevent new trees from growing. A Global Trees Campaign project that planted 2000 trees found a 90 percent 10-year survival rate. Araucaria araucana is a popular garden tree, planted for the unusual effect of its thick, "reptilian" branches with very symmetrical appearance. It prefers temperate climates with abundant rainfall, tolerating temperatures down to about −20 °C (−4 °F). It is far and away the hardiest member of its genus, and can grow well in western Europe (north to the Faroe Islands and Smøla in western Norway), the west coast of North America (north to the islands of Haida Gwaii in Canada), and locally on the east coast, as well as Long Island, and in New Zealand and southeastern Australia. It is tolerant of coastal salt spray, but does not tolerate exposure to pollution. Its piñones, or seeds, are edible, similar to large pine nuts, and are harvested by indigenous peoples in Argentina and Chile. The tree has some potential to be a food crop in other areas in the future, thriving in climates with cool oceanic summers, e.g., western Scotland, where other nut crops do not grow well. A group of six female trees with one male for pollination could yield several thousand seeds per year. Since the cones drop, harvesting is easy. The tree, however, does not yield seeds until it is around 30 to 40 years old, which discourages investment in planting orchards (although yields at maturity can be immense); once established, it can live possibly as long as 1,000 years. Once valued because of its long, straight trunk, its current rarity and vulnerable status mean its wood is now rarely used; it is also sacred to some members of the Mapuche Native American tribe. Before the tree became protected by law in 1971, lumber mills in Araucanía Region specialized in Chilean pine. This species is listed in the CITES Appendix I as an endangered species. The fossils called Whitby Jet (lignite) used in jewelry, are derived from fossilized Monkey Puzzle trees. First identified by Europeans in Chile in the 1780s, it was named Pinus araucana by Molina in 1782. In 1789, de Jussieu had erected a new genus called Araucaria based on the species, and in 1797, Pavón published a new description of the species which he called Araucaria imbricata (an invalid name, as it did not use Molina's older species epithet). Finally, in 1873, after several further redescriptions, Koch published the combination Araucaria araucana, validating Molina's name in the genus. The name araucana is derived from the native Araucanians who used the nuts (seeds) of the tree in Chile. A group of Araucanians living in the Andes, the Pehuenches, owe their name to their diet based on harvesting of the A. araucaria seeds. Pehuen means Araucaria and che means people in Mapudungun. The origin of the popular English language name "monkey puzzle" derives from its early cultivation in Britain in about 1850, when the species was still very rare in gardens and not widely known. Sir William Molesworth, the proud owner of a young specimen at Pencarrow garden near Bodmin in Cornwall, was showing it to a group of friends, one of them – the noted barrister and Benthamist Charles Austin – remarked, "It would puzzle a monkey to climb that". As the species had no existing popular name, first "monkey puzzler", then "monkey puzzle" stuck. The nearest relative found is Araucaria angustifolia, a South American Araucaria from Brazil which differs in the width of the leaves. Also related to the Araucaria genus in the Pacific Islands and Australia, including Araucaria cunninghamii, Hoop Pine, Araucaria heterophylla the Norfolk Island pine and Araucaria bidwillii, Bunya Pine, in Australia. The recently found 'Wollemi pine', Wollemia, discovered in southeast Australia, is classed in the plant family Araucariaceae. Their common ancestry dates to a time when Australia, Antarctica, and South America were linked by land — all three continents were once part of the supercontinent known as Gondwana. Monkey puzzle trees are popularly grown as ornamental trees. ^ a b c d e Premoli, A.; Quiroga, P.; Gardner, M. (2013). "Araucaria araucana". The IUCN Red List of Threatened Species. 2013: e.T31355A2805113. doi:10.2305/IUCN.UK.2013-1.RLTS.T31355A2805113.en. Retrieved 9 January 2018. ^ Native areas, Kew Royal Botanic Gardens. Retrieved: 2012-09-20. ^ Lusk, Christopher H. (2001). "Leaf life spans of some conifers of the temperate forests of South America" (PDF). Revista Chilena de Historia Natural. 74 (3): 711–718. Retrieved 6 November 2017. ^ Veblen, Thomas T.; Kitzberger, Thomas; Burns, Bruce R.; Rebertus, Alan J. (1995). "Perturbaciones y dinámica de regeneración en bosques andinos del sur de Chile y Argentina" [Natural disturbance and regeneration dynamics in Andean forests of southern Chile and Argentina]. In Armesto, Juan J.; Villagrán, Carolina; Arroyo, Mary Kalin. Ecología de los bosques nativos de Chile (in Spanish). Santiago de Chile: Editorial Universitaria. pp. 169–198. ISBN 978-9561112841. ^ Michael A. Arnold (2004). "Araucaria Araucana" (PDF). Landscape Plants For Texas And Environs 3rd. Aggie Horticulture. ISBN 978-1588747464. ^ Shepherd, J.D. & R.S. Ditgen, 2013. Rodent handling of Araucaria araucana seeds. Austral Ecology, 38: 23–32. ^ a b c d e "Monkey Puzzle". Global Trees. ^ "Araucaria araucana in Ålesund, Norway". Scanpalm. Archived from the original on 9 October 2009. Retrieved 27 June 2009. ^ Gallo, L., F. Izquierdo, L.J. Sanguinetti, A. Pinna, G. Siffredi, J. Ayesa, C. Lopez, A. Pelliza, N. Strizler, M. Gonzales Peñalba, L. Maresca and L. Chauchard. 2004. 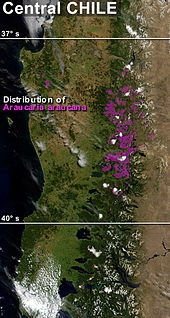 Araucaria araucana forest genetic resources in Argentina. Pages 105-132 in Barbara Vinceti, Weber Amaral and Brien Meilleur (eds). Challenges in managing forest genetic resources for livelihoods: examples from Argentina and Brazil. International Plant Genetic Resources Institute. 271 pp. ^ Anna Lewington & Edward Parker (1999). Ancient Trees. Collins & Brown. ISBN 978-1-85585-974-6. ^ "Appendices I, II and III". CITES. UNEP. Archived from the original on 17 March 2010. Retrieved 8 March 2010. Elwes, Henry John; Henry, Augustine (1906). The Trees of Great Britain & Ireland. vol. 1. Edinburgh, Scotland: (Privately printed). pp. 45–46. Hansen, Carl (1892). "Pinetum danicum". Journal of the Royal Horticultural Society. 14: 257–480. , see p. 341. Lambert, Aylmer Bourke (1832). A Description of the Genus Pinus …. vol. 2. London, England: Weddell. pp. 106–108. Diedenhofen, Wilhelm (1990). ""Belvedere," or the principle of seeing and looking in the gardens of Johan Maurits van Nassau-Siegen at Cleves". In Hunt, John Dixon. The Dutch Garden in the Seventeenth Century. Washington, D.C.: Dumbarton Oaks. pp. 49–80. , see p. 69. ^ Molina, Giovanni Ignazio (1782). Saggio sulla storia naturale del Chili [Essay on the natural history of Chile] (in Italian and Latin). Bologna, (Italy): S. Tomasso d'Aquino. p. 355. Available at: Real Jardín Botánico (Royal Botanical Garden), CSIC, Madrid, Spain. ^ Jussieu, Antoine Laurent de (1789). Genera plantarum: secundum ordines naturales disposita, … [The genera of plants: arranged according to the natural orders, …] (in Latin). Paris, France: Herissant. pp. 413–414. ^ Pavón, Joseph (1797). "Disertacion botanica sobre los generos Tovaria, Actinophyllum, Araucaria y Salmia, con la reunion de algunos que Linneo publicó como distintos" [Botanical dissertation on the genera Tovaria, Actinophyllum, Araucaria and Salmia, with the recombining of some [genera] that Linnaeus had published as [being] distinct]. Memorias de la Real Academia Médica de Madrid (Memoirs of the Royal Medical Academy of Madrid) (in Spanish). 1: 191–204. ; see p. 199. ^ Koch, Karl (1873). Dendrologie. Bäume, Sträucher und Halbsträucher, welche in Mittel- und Nord-Europa im Freien kultivirt werden [Dendrology. Trees, shrubs, and subshrubs which are cultivated outdoors in Middle and Northern Europe.] (in German). vol. 2, part 2. Erlangen, Germany: Ferdinand Enke. p. 206. ^ Wilson, Matthew (July 5, 2013). "Riddle of how the monkey puzzle tree came to be a UK favourite". Financial Times. Retrieved May 14, 2016. ^ Alan Mitchell (1996). Alan Mitchell's Trees of Britain. Collins. ISBN 978-0-00-219972-8. Wikimedia Commons has media related to Araucaria araucana. "Gymnosperm Database: Araucaria araucana". Conifers.org. "Araucaria araucana". Encyclopedia of the Chilean Flora. "Threatened Trees: Monkey Puzzle". Global trees campaign. "The growth stages". Araucaria araucana. "Araucaria araucana – Monkey Puzzle Tree". Conifers Around the World. This page was last edited on 2 April 2019, at 02:56 (UTC).